The only thing more lovable than summer style is a sale on summer style, specifically, a bikini sale. 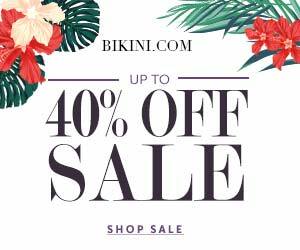 You'll find a bikini sale basically every direction you look off and on the entire season, but don't wait too long to act on the best sale styles right now. From bold prints to crochet to wrap around styles, it's that time of year to stock up on all the pretty bikinis you've had your eye on as we transition out of cold, rainy weather and into the blissful sunshine. This bikini is quite the eye-catcher. Not only are the lines completely mesmerizing, the placement of the design kind of makes it look like you are wearing a bikini and a necklace at the same time. You'll almost be a mysterious optical illusion when you're rocking this piece. Looking to give off a bit of a Kardashian vibe? This high-waisted, wrap-around swimsuit is a true bikini sale treasure. It's truly a perfect mix of coverage, cleavage and compliments to your body's natural beautiful shape. Looking for a suit somewhere between, modern, retro and classic? You've found it. Loving the metallic accents on this bikini. It's a perfect added detail for the already intriguing print. Outshine the sun in this bold bright yellow swimsuit. This bikini has a touch of added character in the playful ruffles around the top and bottom. Stand out in this incredibly festive push-up bikini this season. It's hard to do orange right, but this swimsuit nailed the look with the perfect shade and energetic printed accents. The faux cage look from the criss-cross pattern in this bikini is on point. It doesn't cover too much of the chest area and the straps make way for an excellent showcase of collarbones. Who doesn't love the classic sketches and water color pieces in their hotel rooms whenever they go on a beach vacation? This swimsuit is so perfect because it could fit right into one of those relaxed scenes. The layered, ruffle look is too cute on this white and pink bikini. Bonus, the layered look on top gives a smaller chest a little more presence and the ruffly trim on the bottom brings the whole look together perfectly.